Scarce 19th century map of central London printed on fine silk. Gifford's Flexible Pocket Map of London, Divided into Half Mile Squares & Circles. An exceptionally scarce item, this is Gifford's c. 1884 folding silk pocket map of London, England. The map is printed on fine silk - a novel innovation ideal for the traveler that offers greater durability over traditional paper maps. Centered on the Thames River, the amp covers London from Islington to Stepney and From Kennington to Kensington. The map is divided into both half mile circles radiating from Charing Cross and half mile squares. All streets, parks, rail lines, and bridges are noted as well as important buildings, palaces, municipal buildings, and cemeteries. The map is derived from Bacon's c. 1884 paper map entitled 'Bacon's New Map of Central London.' Bacon's Map Establishment is credited in the lower left quadrant, just outside the printed border. Gifford, this map's publisher is something of a mystery. The only reference we've found is a note in Hyde that suggests that a silk variant has been noted in the collections of the Kensington Central Library, London. Otherwise this map is exceptionally scarce and rarely appears on the market. The Gifford variant is not cataloged in Hyde or any other major collection. Very good. Some toning on original fold lines. Printed on fine silk. Folds into original cardboard case. 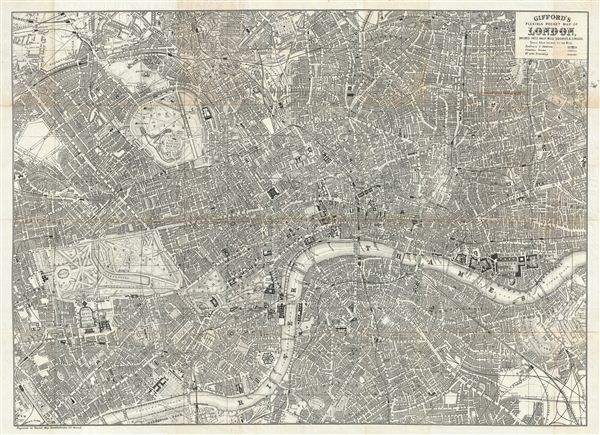 Hyde, Ralph, Printed Maps of Victorian London, 1851 - 1900, no. 201.